Have you tried any Laurie Felt jeans? I saw some on QVC and was tempted to buy a pair. Would love to hear your thoughts. No, I’ve never heard of them. I have two pair of them (Laurie Felt); bought the first pair (flare, when it was a TSV) and they fit wonderfully! I am pear-shaped (would love to call it hourglass, but definitely larger on bottom, 5’7, 155# and can range anywhere from a 6-10 in jeans, but I bought a Tall Small and they are a nice fitted jean). JoLynne definitely knows her stuff when it comes to jeans and I can’t tell you about inseam info and all that, but the feel of the LF jeans is really great. I also have a dark-wash bootcut pair. Super soft, but definitely a jean – I love mine! Good to know, thanks for chiming in! Great, I think I’ll give them a try. I’m going for the Curve Skinny, as I’m curvier on bottom I hope they work out!! I didn’t get your newsletter this morning like I usually do. I hope I’m the only one! I’m going to try the rockstar skinnies. I don’t have much hope, but I need to at least try, right? Haahaa! This is a pretty great day, just saw your comment on your anniversary. Happy Anniversary! Us too (20 years). I haven’t bought jeans in a while – I might have to take another look at some. I really would like a black pair! Wish your daughter a happy birthday! It is a great day, my husband and I are also celebrating our 20 year wedding anniversary today. 🙂 We did a trip to New York (on our bucket list) in late August to celebrate. I am a HUGE fan of AG because they fit me like none other. I see where Nordstrom has their Harper Skinny Straight on sale right now and thought about giving them a try. My issue is the length, 33” is pretty long and I would have to have them hemmed unless I plan to wear with heals…which might be a nice idea because I always wear jeans with flats or sandals. What is your opinion on what shoe works with straights? The website shows them with a low heal bootie. With the raw hems being around, I’ve just been cutting mine shorter…saves tailoring costs! Yes, I know a lot of girls do that! Those look to be a nice, classic straight leg jean that I do think you could wear with heels… or flats… but you would have to choose and then hem them appropriately. That’s a great price! Nordstrom is price matching several styles at 35% off right now, and I can’t figure out which retailer they are price matching with, but wow! That’s a great savings for AG. Really do enjoy these comparison posts, always find something informative and a good picture can be just the ticket to get me to try a new label. I’m strictly a boot cut, straight leg girl, with some boyfriends for more casual occasions. I’m fortunate I can wear jeans to work. I find a dark wash is my best bet as that looks dressier. I do like frayed/raw hems. Not a fan of skinny, faded or distressed jeans. Idea – how about you and Cyndi style selections (active wear, work wear, a dress, date night, etc.) from the same “SAVE” store, like Target, Penney’s, Kohl’s, TJMaxx, etc. for a week? Thank you for sharing house, fashion and family! I really wish AG came in petite! I know I can cuff but it is a lot of excess length on me. Love that bootcut and straight leg jeans made the list. I got new styles on each from the #nsale…just waiting for cooler weather to arrive so I can wear them. And for any petite ladies reading, the petite sizing has scaled down a bit. I was mostly a 12 with them a little loose and now a 12 is snug 🙄 Not as big of a change from the regular line but still annoying. That is so weird. I have not tried any lately. I’m really not a fan of their pants at all, so I don’t usually order them. I like their sweaters mostly. Have you ever tried Mary Kay skin care? If so what was your opinion. I think I dabbled in it years ago, lol, but it’s been ages since I used any of it. I do think it’s a good quality product that has stood the test of time. I’ve been a consultant for almost 30 years and Mary Kay offers quality skin care products for a fair price and the 100% money-back guarantee shows they stand behind their products. My customers don’t have a drawer full of products they don’t use or like and they get personalized service. You should find a consultant in your local area or you can email me with any questions. Love these updates! I read that ripped jeans & heavily distressed jeans are going out of style in 2019. What’s your take on that trend? I’m still seeing a lot of that, unfortunately, but I hope you are right. I like a rip here and there for casual wear, but I’m not a fan of the heavily distressed jeans and the blown out knees that are so popular right now. I do think that is going by the wayside, as I see more of the Levis mom jeans, but I don’t care for that look either, lol!!! I told myself a while back I was done buying ripped jeans, and then AG came out with that pair for the #NSale, and it was love at first sight. I considered buying a backup pair when they went on sale again, and I still wish I had… now they’re gone. Anyway, all that to say, that trend may be on its way out… but I’m not convinced. I agree with your post on the 7FAM, the express (my fave style barely boot), and the old navy rockstar!. Good post i may have to try some of the others too..
Love the post…my favorite the skinnies. the weekend! You hv been my personal stylist for years thanks! Oooh how exciting!!!! What did you wear? I am sure it was beautiful. I finally got to sit down and read your post. Happy Birthday to your daughter! Growing up, I too got to pick what we would have for dinner. It was always fried chicken, potato salad, and I don’t remember what else. This morning I watched the video from the live FB session yesterday. You look fabulous in the teal color you wore yesterday. My go-to brands for my jeans are Sonoma from Kohl’s and Wit and Wisdom from Nordstrom. Both are super soft. The one thing I don’t like about skinny jeans is that the legs bunch up after I sit and I have to keep tugging on them. One thing I need help with is what to pair with my boyfriend jeans. My thinking is that to balance out their fullness, my top should be more fitted. What about a jacket! The outer bands of Hurricane Michael hit us earlier this afternoon. Tornadoes have already hit in some areas, and the worst is expected while we sleep tonight. Power outages is pretty much a sure bet, and will last for several days. We have our emergency bags packed for us and Java, in case we have to leave quickly. You are right, a more fitted top looks best with boyfriend jeans! I hope you managed to keep power and stay safe! Thank you! We were very fortunate to not lose power or sustain property damage. The poor people in the Panhandle area definitely need our prayers. Thanks for a very informative post! I too live in jeans, but I’m frustrated that they bag out. It’s super hard to find them in long sizes, as I’m 5’11”. Any favorite brands in long sizes that you’ve come across? I think you need to be sure to look for regular lengths, not ankle lengths, and so many are ankle these days. For me that is 29″ or 28″. I like 28″ better, I don’t think 29″ is really ankle length on me, and I’m 5’5″ and long legged. So you’re going to want to look for something 30-32″ probably? Hope some of those are helpful. great jeans post. My question – for the raw edge jeans, it bothers me to see threads hanging down. Is it OK to trim them off, or is that defeating the purpose of the raw edge? I trim them when they get bad. I love this post. I started following you in March, and my style has definitely been upgraded because of you. I have bought several pairs of premium jeans (always on sale) but still love my Loft and Talbots jeans. I am having trouble finding a white jean I really like. I have tried Old Navy jeans before, but never the Rockstar, and they are always too tight in my normal size. When I size up, I can’t keep the waist up. You didn’t say how the sizing was on those Old Navy Rockstar white jeans. What did you think? Thank you so much for all of your hard work for us! I have the 8, so that is the larger of my two normal sizes. I felt like they stayed up well, and I was surprised b/c I didn’t like the pink ones as much (the ones in this post.) They definitely improved the white ones. Great post! Love seeing all the jeans – pricey and less pricey – side by side. Once i finally broke down and bought premium denim, I understood why people raved about it. It doesn’t necessarily look better in the store, but it wears better over time and doesn’t need to be washed as much (because it doesn’t bag). I still only buy them at discount stores, so I guess I’m getting last year’s styles, but I can’t tell the difference. My new faves are my 7FAMK (great wash; super comfy). I also love the look of my paige jeans (same skinnies as you have), but I find them less comfortable. I finally broke down and bought a size up from my “big” size, and that helps on comfort but the waist is dicey. I find AGs are tight in the legs every time I try them (I don’t think my legs are big, but I suspect they are bigger than yours). I keep trying though, cuz I know you love them! 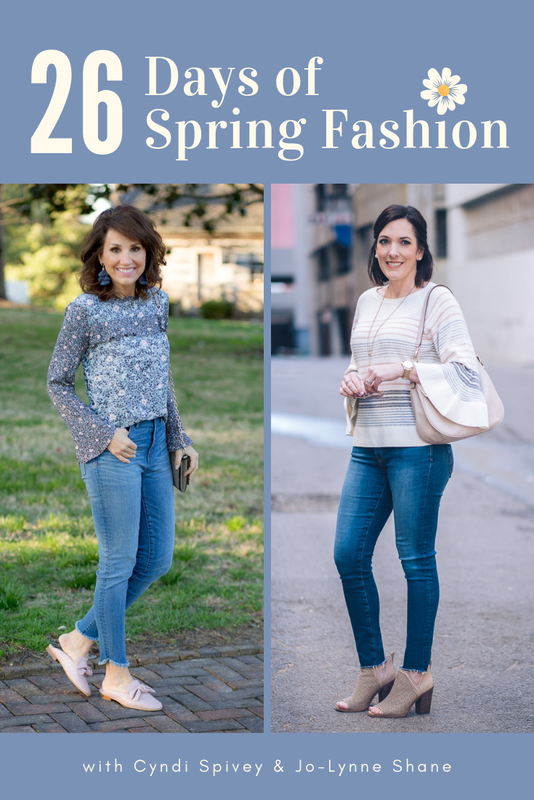 I’m still on the prowl for a pair of wider legged ankle jeans….do you find you wear those Frame jeans (I like them a lot), or do you still tend to reach for the skinnies? Yeah, I have to size up in Paige too. And of course I agree – the comfort and the way they wear over the long haul… so worth it. I have to say, I keep reaching for my skinnies, but I think that’s partly b/c I prefer the straight ankle jeans with booties, and I wear flats almost every day. I know you can wear straight ankle jeans with flats, but… I dunno. I’m not crazy about any of my current options. We’re going out to eat with friends tomorrow night, so maybe I’ll wear them for that. They are so good… but I hear ya on sizing. You want to make the right decision. I do think they run smaller than some AG. I have the 29 rather than the 28, and even now that I’m down a few pounds, they still fit and aren’t getting too loose. Thank you for putting together this post on denim. I wear a lot of denim, also, and I really like the Alina NYDJ ankle jean. I bought some recently at Zappos, or you can find them at Dillards or VonMaur. They’re a really great denim!